Baal HaSulam, “The Wisdom of Kabbalah and Philosophy”: Likewise, all the fixed pictures that we know and use to define materials are inconsistent and do not exist in their own right. Rather, they only dress and undress forms under the influence of conditions such as heat or cold. During the lesson we think about the force that “draws” the material that actually doesn’t exist. If, while we are reading, we are together, we constantly think about the united group and want to discover the general force among us, then we discover a whole world and live in it in a much clearer, more emotional, and more intensive way than our current life. This is no fantasy. Evoke these forces. Now you are looking at the friends sleepily, and they look at you in the same way. So evoke these forces together and you will understand that there are worlds between you and that everything depends on your closeness and unity in your mind and your feelings, in your yearning and your inclination, in the desire to feel your inner essence together. Suddenly you will see how the abstract force turns into something real and concrete. Previously you only paid attention to “coarse” corporeal forces: heat, cold, pressure, etc. But there are much finer and stronger forces in a person than the ones that operate even in the micro-world, on a subatomic level. These fine forces reveal the real material to you. When you enter this field, you discover that it is the beginning and the end of everything, that all of creation is there with its plan. Here, however, there is nothing but the false, artificial, external drawing that is meant to confuse you and to focus you on the correction by false incentives without taking your freewill from you and so as not to turn you into a robot. This realization should focus us on the main thing, on developing the forces that are between us. They are the strongest “weapon” against evil, against all our problems. Even in our imaginary world subatomic forces are much stronger than the ordinary forces of the macro world. A lot of energy is required in order to cause a collision between the particles in the collider. We, however, enter the field of our personal forces that operate between the friends. This is such great intensity that cannot be measured by using the means we have in this world. It is a real force. We only have to reach it and to learn how to manage it, since it will not be revealed without an intention to bestow, for the good of others. Question: Does this mean that there are forces in me that enable me to discover a new reality? How can I find them? Answer: Start acting, exert yourself, fix the connection with the friends, annul yourself, and by that allow them to connect to you. Start evoking them so that they will impress you with the greatness of the goal. We should make such efforts every day, every moment, because the desire to receive is constantly renewed and constantly demands us to renew our relationships, the whole Ha-Va-Ya-H. This is all our work. If you evoke and arrange the forces that connect you with the friends as correctly as possible, the force of bestowal and the force of receiving, you will discover that the relationships between you are much more important than the corporeal world. It will come, since you study and you are expecting the Light that Reforms, and it will influence you. Suddenly you will discover that the relationships between you are the most important thing, and then you will begin to discover a new spiritual material, which is much more real and concrete than what surrounds you today. It will be so powerful, heavy, and real that the temporary, imaginary picture of this world will dissolve on its background. Rabash, “Letter 24”: Regarding your first question about having to stand guard and evoke the love in the hearts of the friends, which you find unbecoming, I actually see that as necessary for you. You know what Baal HaSulam said, that from between man and man one learns how to behave between man and the Creator. And you must always stand guard, all day and all night, when you feel a state of day or feel a state of night. We say to the Creator, “Yours is the day, and Yours is also the night.” Thus, the night, too, the darkness of night, comes from the Creator to man’s favor, too, as it is written, “Day to day utters speech, and night to night expresses knowledge.” (See the Sulam Commentary, Part 1, Item 103). Several conditions are involved here. First we must “stand on guard to awaken love in the heart of friends.” We must do that all the time, which means regardless of my condition: “all day and all night,” which means, when I feel good and elated and also when I feel bad and am in the dark. Despite everything, I must evoke love in each of my friends, in any state, “until the flame rises by itself.” This means that I have to make every effort in order to become the fuel for that eternal flame. If I do that, then I am awarded evoking the love for the Creator, or the love of the Creator for us. Thus we see that this condition is absolutely crucial, like a command that is above time, place, and state, which is an absolute obligation. Accordingly, we have to think about what we do next if without this condition we cannot advance towards the goal. We shouldn’t confuse ourselves that the goal is anything else except for the attainment of the Creator, equivalence of form with Him, since His attitude towards us is love or a desire to bestow, which is the expression of this love. So we must constantly hold on to this goal: In the morning, a person must plan all his thoughts and actions and in the evening, he must calculate what he has done. And so day after day, all day long. We should aim everything at the one requirement: to try to evoke as much love, or at least an awakening, the importance of the goal, which is the same component as love, until the flame rises by itself. This means that our awakening from below should be so strong that it will summon an awakening from Above, and the merging of these two awakenings, from below and from Above, will create a big flame. This is not just figurative language. Whoever seriously yearns for the goal must accept this seriously. These conditions are eternal laws. Question: What is most typical state that a person experiences right before the revelation? Answer: Darkness… He feels that he needs new fuel, new motivations, as the old ones have already been depleted. He is revealing it now. He sees spirituality in the Reflected Light of the upper Partzuf, in AHP of the upper one who is showing this to him as though he is in the hands of the upper one. Now the person feels that he has to grow to the same rung and adopt all of this himself. He has to come down from the hands of the upper one and achieve the same. This happens every time on each new rung: First comes the small state (Katnut), and then the big state (Gadlut). My Comment: European leaders are lost in the new world; they do not understand what is happening, and in this state, the best decision is to decide nothing. They act reasonably and sensibly, looking at what is happening. However, the development in the direction of integration continues, and the social systems that were created in the past become less and less suitable for working with them; that is, they increase the crisis, but that the answer is not in changing the world, but in changing man; this still needs to be understood and then only to agree with the need for integral education. Question: Yesterday a friend who had left the group some time ago suddenly called me and said that he wanted to return. How does such a warm deficiency suddenly awaken in a person? How can we evoke those who have left? Answer: Can anyone avoid the correction of his soul? Anyone who was with us at some point and left will eventually return. You can see that I am not keeping anyone, not even for a moment. If someone wants to go, then let him go; I wish him all the best. I can say that about anyone, without any regrets, since this is his destiny. We have to advance according to the laws that we see in nature and which Kabbalists explain to us. These are nature’s laws and there is nothing artificial about them, Kabbalists tell us about man’s psychology and how to use it correctly in order to advance and to reach the top, to rise to our inner psychology, to an inner connection, to enter the world that is behind elementary particles, photons, atoms, all matter. We have to penetrate this field where the force that sustains all of reality is concealed. All this happens according to exact laws, and there is nothing accidental here. We have to advance towards this, and as a result of our advancement, a more powerful force field will appear around us. Then it will begin to influence the people who were with us and have left, and also people who have not reached us yet. Their charge, their spark, their “point in the heart,” their spiritual potential is still weak, and so they studied a little and left or haven’t reached us at all yet, but are still on hold. They are close to us, but our field isn’t strong enough in order to draw them. Our force field is still weak and they are weak in their charge. But when our field grows and becomes stronger, it will draw them inward. Then we will suddenly see how the door opens, and they walk in. It will undoubtedly happen. It all depends only on our advancement; we don’t have to perform any external actions with regard to them. It all depends solely on us, and we have to perform the correction that is our duty. So our work is mainly the inner spiritual work. We have to disseminate our materials all over the world in our free time, and for this work we have our Kabalistic factory. This is the external work, but 90% of all our work should be dedicated to our inner work. All our forces and our attention should be aimed at our inner advancement. We do the external dissemination outside the global group for our advancement, since we depend on the extended society. There cannot be love without hate. After all, love comes precisely as the correction for hate. It isn’t an innate part of us, but we have to build it by ourselves. This is where the command of “love thy friend as thyself” comes from: From the love of the created beings we move on to the love of the Creator. The Creator is the general, sum of all the forms of love. But first I discover the matter of my egoistic desire, my “Mt. Sinai“, my mountain of “hatred,” the shattered vessel to its dark depth. This is called the “illumination of Malchut,” and it is really frightening. Then I have to correct this hatred, and only by that do I reach love. 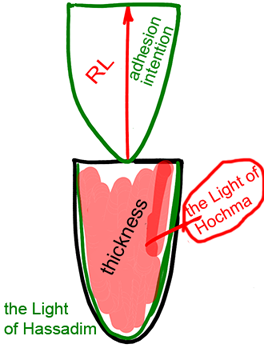 This is how the vessel is built; below there is thickness and above a Masach and the Returning Light (RL), which means adhesion. In the upper part I form my attitude to the Creator, all my intentions, and then I cover my hate with the Light of Hassadim below. Then comes the Light of Hochma and fills the vessel. This happens time after time until the end of correction. Hate which is opposite from the Light remains, since otherwise I will not be able to be independent. Question: Does that mean that I have to come to the lesson charged with rejection, and aversion in order to overcome it? What deficiency, what feeling of a flaw, should I bring with me? Answer: Don’t look for hate. You should not come with a flaw, but with love. There is only one goal and what comes along the way is not our business. If hatred is revealed—let it be revealed, and if not—then it isn’t. I have to be attracted to one thing only, and if in the process I discover in me an inability, lack of understanding, lack of knowledge, etc., it means that that’s the way it should be. I want to be clever, and on the way I discover that I am still stupid. But I am yearning for something that is totally different. So despite everything, I need to focus on the final goal. From Baal HaSulam’s article “Introduction to The Study of the Ten Sefirot”: …it is the path of Torah, meaning the extensive preparation one must make to prepare the purification of his body before he is actually rewarded with keeping Torah and Mitzvot. This is talking about the so-called “preparation time.” A person comes to study Kabbalah, but he doesn’t yet understand where he is. He starts with some introductory lectures, then he gets acquainted with a group; he participates in various workshops and common work. If he joins a group, he picks up new values and attitudes from his group whether he wants to or not. This is how one’s preparation period begins; it lasts until one reaches a state called “Lishma,” meaning that the Reforming Light begins to impact him in a way that his desires are altered. Once while driving with Rabash to a sauna, I asked him about the way to check my level of “Lishma.” He explained it to me as follows: “A friend of yours is returning an envelope with some money that he owed you. There is $1,000 in the envelope. You count the money and see that there is $999. You think it’s not a big deal and decide that most likely your friend simply miscalculated the amount and overlooked that it is short by $1. You think that it’s not even worth mentioning it to him. So, you seal the envelope and close the deal. This is called “acting within reason.” If you count the money or if you are driven by any sort of calculation, it means that you are ruled by your mind. If you count the money, and still accept your friend’s estimation, (it’s obvious that he wanted to return the whole amount of $1,000), then you accept the envelope without any hesitations whether or not it contains the whole amount you are supposed to receive back. It means that you go beyond your own opinion and above your mind. Question: By studying Kabbalah, we turn from the “nations of the world” to the “people of Israel.” If I understand correctly, in reaching spiritual attainment do we obtain greater suffering than the “nations of the world?” Or do we understand the cause and effect relationship? Answer: I have many friends from school, university, with whom I sometimes keep in touch. They are developed, normal people, but they don’t understand me. In any case, I don’t neglect anyone of them; I appreciate and love them, but we are just different people. So, we can’t evaluate ourselves relative to others. It’s easier for someone and more difficult for someone else; everyone has his own destiny. The only thing that a person should do is to realize himself as he is. You shouldn’t envy anyone, saying, he is lucky, look how rich he is, and this one is a slacker, but everything is easier for him; the third one was born “with a silver spoon in his mouth.” It will not help. This suggests that you just don’t know how to realize yourself. One has to learn! Take your truest, deepest desire, longing, and start being yourself. You will see that this is the best that can be. It’s unlikely that you will be happy if you change places with someone. Only by realizing yourself, by becoming similar to the Creator, will you be completely fulfilled. As to moving forward, the more a person advances, the greater emptiness emerges in him. But these voids become filled with insight, a sense of eternity, perfection, eternal life, a sense of Infinity. A person sees the universe from end to end. An average person in this world, for example, a shepherd walks with cows in the meadow, whistling, feeling good, alive and well, with no worries in his head. Can we envy him? Yes, of course. But envy what and up to what point? After all, there comes a state when he will have carried out his program. So, don’t think about suffering. Realize yourself! Otherwise, it turns out that you curse the Creator for having created you. What could be worse than that? So, let’s be grateful! Why Am I Not Prince William? Question: Let’s say the Creator draws a picture for us of someone incapable of coping with a disease or getting out of some bad state. Is it a manifestation of the group’s weakness? How do we react to these situations? Answer: We cannot say that it is a consequence of a group’s work. We are tied to the whole world. The group we are currently in is not a small number of people who used to study a thousand years ago when the world was “sealed” and developed egoistically. For example, the groups of ARI, Ramchal, Rabbi Shimon, or Rabbi Akiva were detached from the rest of the world. The world, its so-called Babylonian part, has been developing egoistically, whereas Kabbalistic groups advanced independently. They used to discuss within the group only what really pertained to their group. Today, the world advances in general; it has become global. Now, we move forward not because we deserve it or don’t deserve it, but rather, because we have to move ahead for the sake of correcting the entire world. So, we cannot say that somebody fell or was elevated as a result of the internal group work within one particular group or any other groups; we all are closely interconnected. Today, these problems cannot be resolved this way. Question: What do we do if the importance of the goal is missing? It happens all the time: People come to class and fall asleep. What methods can a group use to elevate the greatness of the Creator and the importance of the goal? Answer: It doesn’t matter if someone falls asleep. It happens sometimes! He came to class with his last strength and fell asleep. So what? What can you do about it? How can you awaken him if he is “dead”? At this moment, he is not a human being, but rather a “plant.” You cannot inspire him at this time. People have the need for sleep, nutrition, and other natural necessities. You cannot do anything about it; you just have to take it into account. You cannot demand anything of your friends unless they sleep at least 5-6 hours and eat a couple of times a day. Question: This is clear. Although it’s still not clear to me how the group should take care of increasing the importance of the goal. How do you do that? Just try! Think of it all the time. If you keep thinking of it, it will make an impact. This is our work, and we cannot escape it. We are driven by egoism. In this we are opposite to the Creator. When we advance to the next level, we’ll be dealing with totally different and extremely severe conditions of spiritual work: hatred, difficulties, letdowns. They all come from the Creator! We have to agree with them, unless someone is “drilling a hole in the boat,” which may harm our spiritual work. In this case, we have the right to take this person off the boat and expel him from the group. However, if he falls asleep, you should put a pillow under his head as you would do for your little son.